Have you abandoned the traditional business card in favor of an all-digital, paper-free marketing strategy? If you have then you are missing out on some great marketing opportunities. Most younger business professionals don't see the value of a business card, while older business professionals tend to still use them the same exact way they did 20 years ago. Some argue why a business card is needed when everyone has a mobile phone these days. Others wouldn't dare leave their office without a business card. The problem isn't the business card, it's the way it's being used, or not being used. If you're still the guy handing out business cards telling everyone, “Hi, my name is George, call me if you have any real estate needs in the future!”, then, by all means, throw away your business cards because that lame approach no longer works. Actually, it never did. Business cards have always been, and still are, a very effective marketing tool. If done right. What would you rather do? Hand out your business card like a desperate used car salesman, hoping someone calls you one day, or have people asking you for your business card (with no selling on your part), simply because they think it is super valuable. A business card should still be part of your marketing arsenal, it just needs to be tied to your online marketing strategy. They should be working together, with your business card working as a marketing tool, pulling people into your online marketing funnel. Think of it as an offline version of Facebook Ads or Google Adwords, but more personal, with a smaller reach yet still very effective. 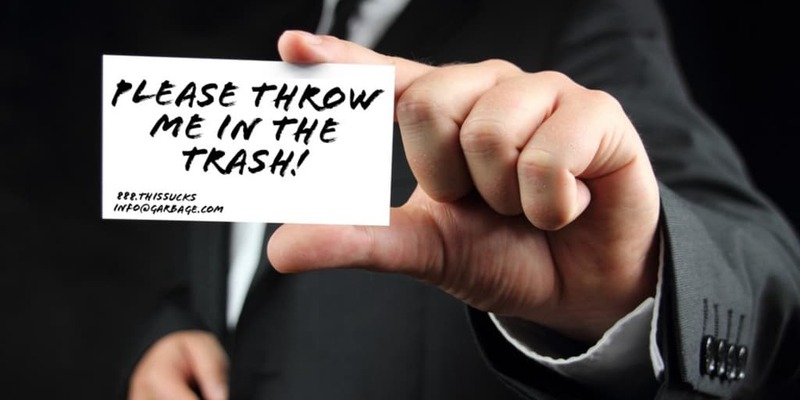 If you want your business card to be saved and not thrown into the trash like every other business card, then it needs to have value in the eyes of the recipient. You create value by having something valuable to offer. This means that just having your name, email address and phone number on your business card isn't going to cut it. You're just wasting paper and everyone's time. Your business card should have value. It should have a purpose. It should make people want to hold on to it and not want to lose it. You should be able to generate leads with your business card. You do these things by giving your business card a job to do, to drive people into your online marketing funnel, turning them into leads for your business. Below I am going to outline a specific strategy on just how to do that. Yes, it's a bit more work upfront, but it'll turn your business card into something useful for both you and the people you are giving it to. It'll also open up a new marketing channel for your business. You'll need to set up an online marketing funnel, which you should have regardless as it's hard to have an effective online strategy without one. We are going to review steps below but you can learn more about online marketing funnels here. You can also sign up for my free video course on creating your own online marketing system here. Yes, you need to offer something of value to people if you want them to have any kind of interest in you or your business. This initial offer should be something free or low cost, but still offers a lot of value. This offer should solve a specific problem for your potential customer and should be seen by them as something valuable enough to want to learn more. An offer like this is not a, “call now for a free quote”, or, “schedule an appointment today”. These are not offers, especially if you and all of your competitors offer this as standard practice. Real estate – A downloadable checklist for first time home buyers to make sure they do everything needed to save time, money and get the dream home they want. Restaurant – Get a free dessert with paid entree. Give one offer with the card, have them register to get one each month. 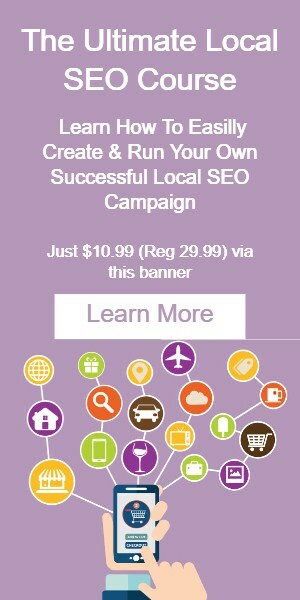 Marketing – Free do it yourself Local SEO checklist. This is one that I offer sometimes on my website, generates over 200 leads a month and took me 90 minutes to create. You get the point. The offer doesn't need to be extravagant or expensive, but it does need to be valuable in the eyes of your potential customer if you hope to get a response. I created the Local SEO checklist myself using Google Docs. Don't be afraid to give away what you know, if you don't, someone else already is and getting the business you should be getting. A special introduction/greeting for the people who get your business card and visit your landing page. This can be text-based or even better, a video from you. The l=URL for this page will be printed on your business card. An optin box that will ask for their name and email address. People will visit your page via the business card and if your offer is good enough, will optin to receive your special offer. Now once someone opts into your offer, you can redirect them to another page where they can redeem your offer. Most online optin forms allow you to set a Thank You Page url, this is where you will send people to after they fill out the form (and click the submit button) and can redeem the offer automatically without you having to do anything. Using an optin form as part of an email marketing service like MailChimp is ideal as they will automatically be added to your email list. But it is not necessary, you can simply use a regular online contact form builder on your website and have the notifications sent to you whenever someone opts into your offer. You are now building a list of leads you can follow up with. Now that you have an offer and landing page in place, you can now get your business card created. You can set up all of the usual information on the front of the card, but you will have your special offer printed on the back of your business card. You will also have the URL of the landing page you set up in step 2. You can use something short and easy to remember like “yourwebsite.com/hello”. Sign up for my online training course, “Lose 1o pounds in 30 days without dieting”. It's valued at $99, but free to you with this card. With all of this in place, you no longer have to try and push your card onto people along with a cheesy sales pitch. You now have something valuable to offer people and all you need to do is sell the offer, not yourself. And if you're offer is good enough, it will sell itself, all you'll need to do is mention it to people. A great offer turns this….. It's much easier when people are asking you for your business card instead of you trying to push it on them. With an online marketing funnel in place and a strategy on how to use your business card, you don't have to keep printing business cards that eventually end up in the trash. Your business card is now part of your overall marketing strategy and a lead generator for your business. Now you can go out and become a power networker who is also generating a steady stream of leads for your business.